Actress and musical legend Patti LuPone will visit the University at Albany for an evening of conversation with WAMC's Joe Donahue as part of The Creative Life: A Conversation Series. Free and open to the public, the event will take place at 7 p.m. on Thursday, April 26, at Page Hall on UAlbany’s Downtown campus. The Creative Life series is a major arts initiative of the New York State Writers Institute, UAlbany Performing Arts Center and University Art Museum in conjunction with regional public radio station WAMC Northeast Public Radio. LuPone most recently starred on Broadway as cosmetics pioneer Helena Rubinstein in the musical War Paint, for which she received Tony, Drama Desk and Outer Critics Circle Award nominations for Best Actress in a Musical, and will be returning to London's West End stage in Marianne Elliot's new production of the Stephen Sondheim-George Furth musical Company later this year. LuPone is a two-time Tony Award winner for her performances as Madame Rose in the most recent Broadway revival of the musical Gypsy and for her now legendary performance in the title role in Andrew Lloyd Webber and Tim Rice's Evita. Other recent New York stage appearances include Douglas Carter Beane’s Shows For Days at Lincoln Center Theater, her debut with the New York City Ballet in their production of The Seven Deadly Sins, the New York Philharmonic’s production of Company, David Mamet’s The Anarchist, and Lincoln Center Theater’s production of the musical Women on the Verge of a Nervous Breakdown. 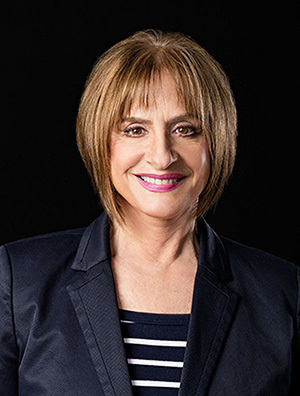 A graduate of the first class of the Drama Division of New York’s Juilliard School and a founding member of John Houseman's The Acting Company, LuPone has starred in several television and movie productions and her musical recordings include Far Away Places, Patti LuPone at Les Mouches, The Lady with the Torch, and many original cast recordings including most recently War Paint, Women on the Verge of a Nervous Breakdown, Gypsy, and Sweeney Todd. 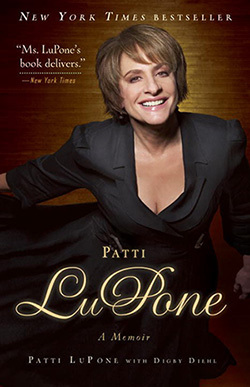 Her memoir, Patti LuPone: A Memoir, became a New York Times bestseller. Following LuPone's appearance at UAlbany, she will bring her critically acclaimed concert, Don’t Monkey with Broadway, to Proctors in Schenectady at 8pm on Friday, April 27. Proctors box office: (518) 346-6204 or https://www.proctors.org/. LuPone, will explore, through indelible interpretations of classic Broadway show tunes by the likes of Richard Rodgers, Lorenz Hart, Jule Styne, Leonard Bernstein, Stephen Sondheim, Cole Porter and Irving Berlin, how her life-long love affair with Broadway began and her concern for what Manhattan's Theatre District is becoming today. The Creative Life series brings leading figures from writing, music, dance, choreography, visual arts, architecture, theatre, and filmmaking to the University for conversation with Donahue about their creative inspiration, craft, and careers. Previous guests in The Creative Life Series have included fiction writer Joyce Carol Oates, tap dancer-choreographer Savion Glover, jazz violinist Regina Carter, painter David Salle, author Lois Lowry and choreographer Garth Fagan. Major support for The Creative Life is provided by The University at Albany Foundation with additional support from the UAlbany Alumni Association, College of Arts and Sciences, Office of the Provost and University Auxiliary Services. For additional information, call the UAlbany Performing Art Center box office at 518-442-3997.